Planning on buying some new lights for Christmas this year? Why not buy them early and get double-duty out of them? 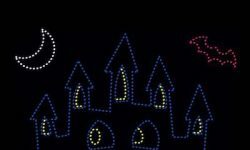 It's worth considering, because those Christmas light sets can also be used to make great Halloween light displays. Though no holiday is as big as Christmas, Halloween is pretty popular in its own right. And lots of people that are Christmas enthusiasts are also Halloween enthusiasts - and many Halloween enthusiasts go all-out in decorating their homes for Halloween. LED light displays offer great décor for both holidays. Just fine-tune your colors a bit for each holiday, and you're good to go. Though the two holidays are very different, they share some common colors. The primary Christmas colors of red and green, for example, are both also Halloween colors. Green represents monsters and goblins, and red represents blood, fire, and is also a primary autumn color. Orange is often found in Christmas light displays, and it too is a primary Halloween color, representing pumpkins and jack-o-lanterns. Orange is also popular as a mainstay color of autumn. Purple bulbs are sometimes found in Christmas light displays, and purple has become one of the most popular of Halloween colors. Purple represents the darkness of night, the supernatural and mysticism. If you use empty socket light lines for your holiday light displays, you can easily fine-tune them for different holidays. Let's say, for example, that your light lines are set up for Halloween, so they're heavy on orange and purple. As Halloween fades into the past and the Christmas season begins, you can just swap out many or all of the purple and orange bulbs for Christmas green and red. Using empty socket light lines gives you the ability to swap out individual bulbs at will. And that means that you can color-coordinate your lights for Christmas, Halloween and other holidays (How about red, white and blue bulbs for Independence Day?). All it takes is a bit of time and a supply of bulbs in holiday-appropriate colors. You'll be celebrating each holiday in style, and getting maximum return for your investment in holiday lights. A pretty good deal!